Penelope's Room: A small space with built-in cabinets. This room was created out of an alcove that was part of the apartment’s entry hallway. It needed “walls” to define its boundaries so we created built-in cabinets to serve as both wall and storage unit, and to enclose the space. 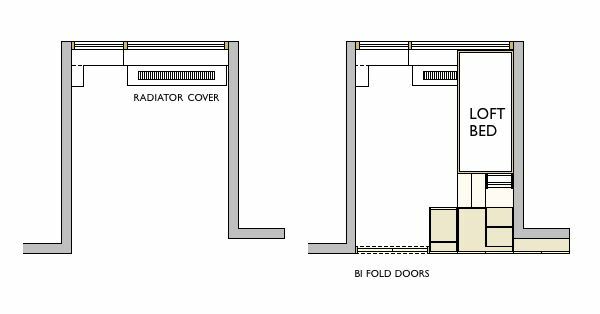 We designed the cabinets to be accessible from both sides, creating new storage units for both Penelope’s room and the apartment’s kitchen (before and after floor plan illustrated below). In this case, the room was so short that in order to fit the bed into the space, we mounted one end on top of the window sill, creating a bridge over the radiator. The hanging tray, next to the pillow, serves as a nightstand while the steps up the loft double as drawers. This loft bed comfortably fits mom and Penelope during story time. The featured product in this room is a customized version of our Marino Loft bed.